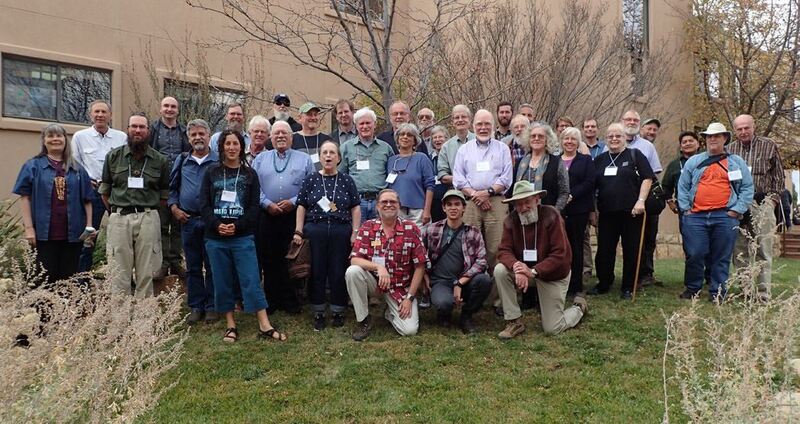 This conference was a forum for deepening our understanding of the relationship of religion, storytelling and practices related to cultural anthropology and astronomy across the American Southwest, Mexico and beyond. Hence the geographical term Greater Southwest, which encompasses an area much larger than the current border-limited area normally considered as the American Southwest. Our call for papers requested presentations on multiple subjects including the regional interchange of ideas and culture, perspectives of Native American and other indigenous peoples as well as subjects on landscape archaeology, methods of visualization and the impact of public architecture. One of our most successful sessions was a day devoted to developing a better understanding of cultural landscapes through the eyes of our Native American guests. Understanding the Native American perspective is crucial to interpreting the data we collect and the cultures we study. The day began with a Circle of Introductions where we all sat in a circle of chairs and introduced ourselves to the group. We each explained our various backgrounds and the reasons that brought us to this place and time. Even though this process took some time to complete, it was an important step toward opening the door to better communication. We had a number of Native American presenters from Pueblo, Navajo and Ute peoples. We thank each of them for sharing with us and are working with them to bring what they shared to the conference publication. The conference included an hour long discussion session on lunar observations. Led by Ray Williamson, it focused especially on the question of whether or not the ancestral inhabitants of the Greater Southwest noted and aligned structures to the rise and set of the moon at the lunar extremes. This is an important question because although several investigators have claimed to have found alignments to the rise or set of the moon at extreme lunar standstills, we have no supporting evidence that the Ancestral Puebloans intended those alignments. After all, evidence of a specific alignment is not in itself evidence that it was intended to mark the lunar extremes. The discussion was spirited but polite, with several participants offering the evidence of alignment at Chimney Rock in Colorado, a visually stunning sight, when photographed. Others cited the lack of any mention of lunar observations along the horizon in the ethnographic literature as casting doubts on the validity of lunar extreme alignments. The session also included discussion of just what use the Ancestral Pueblos might have made of such observations. Would they primarily have served a practical purpose or a ceremonial one? No conclusions were reached, but the discussion illuminated a major issue among practitioners of Southwestern cultural astronomy research. Keeping the conference participants busy was accomplished by having evening programs each day starting with conference registration and a reception at the Destination Grille. The next day we held a public outreach lecture, Ancestral Astronomy in the Puebloan Southwest, given by Bryan Bates of SCAAS. This was a free event hosted by the Sunflower Theater in Cortez, CO. About 40 conference participants attended with an additional 50 members of the public coming to learn about cultural astronomy and our organization. On Thursday evening, Von Del Chamberlain gave us a program titled Crystals in the Sky: Dine' Stellar Depictions. The program was well enjoyed by everyone with an article featuring his program published in the Cortez Journal, the local newspaper. Following his presentation, Von Del Chamberlain was awarded the Carol W. Ambruster and Lifetime Achievement Awards by SCAAS for his lifelong contributions to the field of cultural astronomy and anthropology. Our evening programs concluded on Friday with the SCAAS Awards Banquet again hosted by the Destination Grille. We enjoyed a private cash bar, sumptuous appetizers and then a Fajita buffet. At this banquet we awarded Dr. Todd W. Bostwick the Carol W. Ambruster and Lifetime Achievement Awards for his service to the Society, cultural astronomy and cultural anthropology. Ken Zoll was given an Outstanding Service Award for his work in cultural astronomy and service to SCAAS. Our friends were not able to attend the banquet so they will receive their awards at a meeting of the Verde Valley Archaeology Center in Camp Verde, AZ in the near future. Our final Outstanding Service Award went to Greg Munson for his tireless work to establish SCAAS as a nonprofit organization and his work as President of the Board of Directors. The evening concluded with a presentation by Scott Ortman on The Mirror-Image and Tewa Origins. We thank Scott for the program and his continued support. Throughout the conference, Tony Hull and Elizabeth Jewell ran a silent auction of books and artwork with the proceeds going to the Carol Ambruster Memorial Fund. Thank you to everyone who donated items. We raised $1040.00 dollars in the auction for the fund. This conference also featured three field trips for conference participants. Greg Munson and Bryan Bates led a trip to Mesa Verde National Park. The purpose of the trip was to review the research conducted by Greg Munson, Larry Nordby and Bryan Bates at Sun Temple and Cliff Palace. The group also enjoyed a Ranger guided tour of Balcony House. Butch Wilson, former Superintendent at Chaco Culture National Historical Park, was the group’s Crow Canyon driver and added a unique perspective with his experience at Chaco Canyon and as a former Mesa Verde National Park Ranger. He also provided a great “river lunch” for us to enjoy. 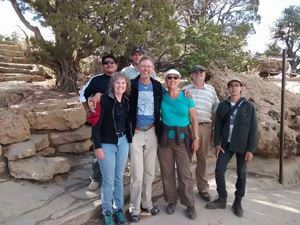 The largest group went on the field trip to Hovenweep National Monument led by Ray Williamson. 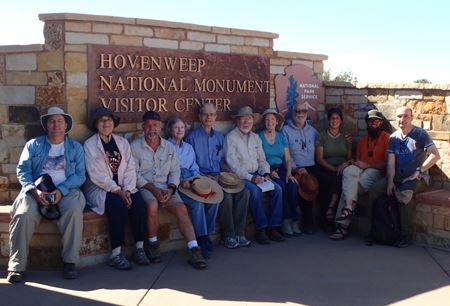 They visited the sites at Holly House, Hovenweep Castle and the Cajon Unit of the Monument. Ray certainly provided a great program and from the looks of all the sunburns, the group experienced good weather with plenty of sunshine. 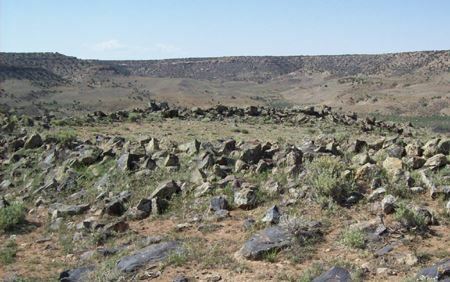 Our more adventurous participants accompanied Virginia Wolf on an off-trail hike to see the Cross Canyon Stone Circle, a site researched and reported on by Virginia and Scott Ortman during the conference. The conference was a huge success. We had an attendance of 50-60 participants on each day including most of the staff at Crow Canyon Archaeological Center. Thank you to one and all who helped and participated, it would not have been possible without everyone's support. We want to particularly thank Mark Varien, Grant Coffey and Dan Simplicio of Crow Canyon Archaeological Center and the Crow Canyon Research Institute for their assistance in planning the conference and helping us to ensure a flawless execution of events. Additional details about the conference and a link to copies of the conference schedule and Compendium of Abstracts can be found on the conference page of our website. This conference generated papers and presentations that we want to publish in a conference volume. Greg Munson has graciously volunteered to be the Managing Editor of the volume. Additional members of the publication committee are Ray Williamson, Bryan Bates and Beth Jewell. So far, most of our presenters have expressed an interest in submitting papers for publication. A special section of the publication will be devoted to essays completed by our Native American guests. We are now in the process of establishing writing guidelines to help the authors complete the first draft of the papers. When we get a better idea of the composition of the volume, we will be soliciting publishers, particularly academic presses. We have a goal of publishing the volume within one year of the conference. To accomplish this goal we will need to raise funds for contracting technical editing, support of Native American authors, printing, and other expenses related to publication of the volume. The SCAAS General Donation Fund (SGDF) will be used to benefit this publication. If you have the ability, please make your tax deductible credit card donations to this fund on our website. Please indicate that your donation should go to the SGDF. If you prefer to donate by check, which we prefer as we do not incur fees, a donation form is available on the donations page. All donations recorded or postmarked by midnight December 31, 2016 will be provided a receipt for the 2016 tax year. During the conference we held a general meeting of the SCAAS membership. It was reported that the Society has a total of 70 active members, 37 of which attended the general meeting. During this meeting the membership voted on a new Board of Directors. Greg Munson announced that he will be stepping down as President of the SCAAS Board of Directors. The new board and officers are: Bryan Bates – President, Tony Hull – Vice-President, Ric Alling – Treasurer, Ray Williamson – Secretary and Board Members-at-Large Greg Munson, Beth Jewell and Chris Dombrowski. This represents an infusion of new perspectives and skills. At the meeting it was announced that SCAAS will be working to hold a technical workshop in the fall of 2017 and our next conference in 2018. Planning has already begun for these events. We are also working on a “Visioning” program to direct the future of SCAAS that features more involvement of the membership. If you have particular skills and an enthusiasm for the Society, we can use your help. We need more involvement in our social networking and fundraising for the Society. Please contact us at inquiry@scaas.org if you can help.